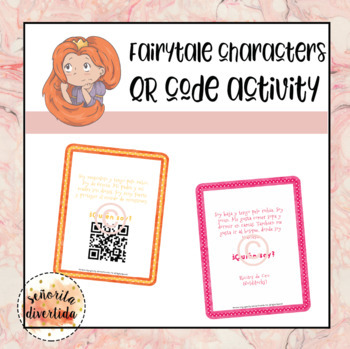 This activity provides students with six short and simple written descriptions of popular fairytale characters. It is the students' objective to determine the identity of the mystery fairytale character. 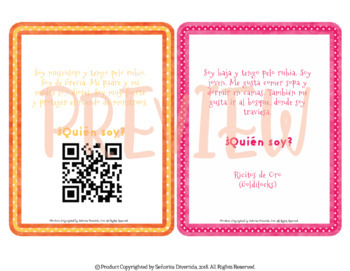 Two versions of this activity are included: one in which the correct answers can be found by scanning a QR Code, the other in which the correct answer can be found by raising an answer flap that is attached by you. I use this activity in my classroom to practice physical and personality characteristic vocabulary and place the six posters in stations around the classroom. If you want to earn TPT credits to lower the cost of future purchases, follow these easy steps: 1. Go to your ‘My Purchases’ page. (You may need to login.) 2. Beside each purchase you'll see a ‘Provide Feedback’ button. Click this button. 3. Leave a rating and a short comment for the product. That’s it! Each time you give feedback, TPT gives you feedback credits that you use to lower the cost of your future purchases. I value your feedback greatly as it helps me determine which products are most valuable for your classroom so I can create more for you! Look for the green star next to my store logo and click it to become a follower and receive updates about my store. It pays to be a follower!